I am fortunate to witness brilliance in training by my amateur athletes on a daily basis. This intimate knowledge of my athletes’ victory, achievement, and at times disappointment, stirs my athletic spirit in a way few things can. It is the relentless grind that is worthwhile. While race results, wins, and PR’s are one sign of success, what is more significant and less visible are the daily accomplishments of average men and women tackling goals that hold personal meaning. These are these pursuits I wish to share. Three athletes have agreed to share their training and racing experience with our followers over the 2019 season. My goal for asking these athletes to share their experience is simple: I want challenge the idea that “talent dictates distinction in endurance sport”. Excellence can be achieved by anyone who is focused, committed, and consistent. I have asked each athlete to be brutally honest about their training and racing experience – even if it means calling me out or disagreeing with me as their coach. I may provide commentary or background on a given blog entry but any thoughts that are my own will be identified at the end with my initials (LV). Please note opinions expressed by our athletes do not necessarily reflect the opinion of BASE Tri Fitness. Meet our first featured athlete, Richard. Richard will be training with the goal of qualifying for Kona at Ironman Lake Placid. Richard earned (and declined) a slot in 2017. Richard is an engineer by trade and comes from a military background. He is task-oriented, with a clear, logical thought process and executes his training with precision. His commitment to impeccable preparation makes Richard a consistent threat in long course triathlon. I asked to Richard participate in this project to showcase what it takes train and race as a competitive age grouper. Early on in 2015, while I was training for Ironman Chattanooga, Coach Lauren suggested that I had the ability to qualify for Kona. I laughed at her. I grew up playing baseball – certainly not doing triathlon. I didn’t start swimming, biking or running until I was 39. 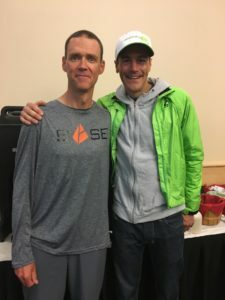 When she started coaching me in 2012, she quite literally had to teach me how to translate the workouts she posted in TrainingPeaks – and she thought I could qualify for Kona? I reminded her of my first Ironman in 2013 when I finished 76th in my age group. I told her I would love to go to Kona but I didn’t think I was good enough…but the seed had been planted in my mind. Six months later I finished 7th in my age group at Ironman Chattanooga. That night I was in a panic. “Where is the awards ceremony and Kona slot allocation held?” “How many qualifying spots are there in my age group?” “What if they roll down to me?” “How much does Kona cost?” My head was spinning. The next morning, I went to the awards ceremony. Five slots went to my age group and none rolled down. Coach was right, I was in the mix and had the ability to qualify. I decided to make Kona a goal for the following year in 2017. Planning for 2017 began right away. I started thinking about what course would best match my abilities. The swim is my weakness. A wetsuit swim or a down river swim (or better yet a wetsuit down river swim) would suit me best and lessen any lead a stronger swimmer might have on me. I am decent enough on the bike. My strength-to-weight ratio is my best asset so a course with hills would also limit any lead an uber biker might be able to gain on me. I am definitely a runner. I joke that I am a runner who rides a bike and is willing to swim 2.4 miles to get on my bike. I figured the tougher the run the better. With a wetsuit swim on a small calm lake, Lake Placid caught my eye. The bike course has 7,900 feet of climbing and a run course with 1,500 feet of gain. Even better, the run has a 2 mile long brutal hill the runners start climbing at mile 10 and again at mile 22. That hill at mile 22 convinced me that Lake Placid was the course for me. Coach agreed. In 2017 I finally got my chance to stand at the starting line of my dream course. I finished 5thin my age group and qualified for Kona! Life had other plans and I sadly had to decline the slot I had worked so hard to get. In 2019 I plan to go for a Kona slot and again I’m choosing to race Lake Placid. There is a benefit to racing a familiar course but on top of that – it is within driving distance so logistics are not too bad. It is a wonderful quaint town capable and eager to support an Ironman event. The course is gorgeous. The bike and run are beautiful, in addition to suiting my race style. Looking over all the race courses within driving distance of Columbus, Ohio, where I live, the Lake Placid course is the best option for me on a number of levels. I look forward to the training this year and will update readers on my progress as the season develops.